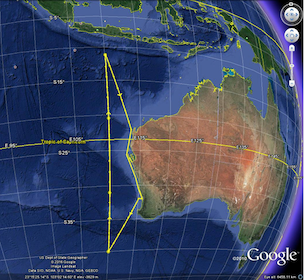 This research voyage will occur in May 2019, and will revisit part of the Australian EEZ (110°E; track on the map indicated by a yellow line) last studied five decades ago when a baseline was established for the physical, chemical and biological oceanography of this atypical ocean region. As part of the second International Indian Ocean Expedition, we will put a multidisciplinary, world-leading team aboard the RV Investigator to undertake an integrated oceanic ecosystem study incorporating physical processes, nitrogen sources, primary productivity, food webs and bio-optics. This study will assess the effects of climate change on Australian ocean domain against the 1960s benchmark and contribute to development of mathematical models to assist in management of Australia’s oceans. We are currently in the preparation stage for this major voyage. More to come later !